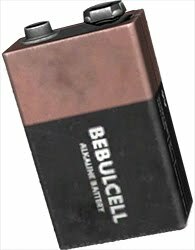 BebulCell alkaline 9V battery. Both electrical contacts on one side of the battery, the positive one being the smaller one. Licking both contacts can tell you if it still carries a charge and possibly give you a slight energy boost. This battery is used in a variety of electrical objects to power them, however it has a limited charge and will no longer provide any power after extended use. By holding the battery and selecting 'Lick' you can test the battery by placing the contacts across your tongue, to determine if it is full, half-charged or empty.